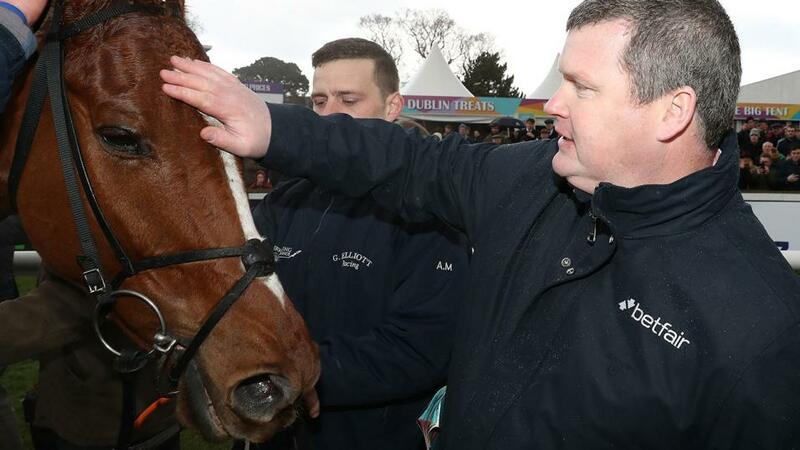 "...went like the best horse at the weights in a muddling race on her chasing debut at Galway last month..."
Horse In Focus DEMI PLIE had plenty in hand when notching a second success of the season at Fairyhouse three weeks ago (under this jockey) and might be up to defying the handicapper again. Isabel's Gold was a good second at Thurles last time and can figure again, while Sunset Shadie should still be competitive after a 6 lb rise for Clonmel. The Jessica Harrington-trained FORGE MEADOW went like the best horse at the weights in a muddling race on her chasing debut at Galway last month and she's clearly capable of much better given her useful hurdles form. Supreme Novices' third Mengli Khan, who makes his chasin debut here, and Trainwreck, who has shaped well in two starts over fences, are feared most. The unexposed CRESUS DE GRISSAY was supported at long odds and shaped well on return from 15 months off when runner-up at Wexford 31 days ago, noted finishing strongly. He's open to improvement now handicapping and makes appeal tackling this longer trip under a more experienced jockey. Se Mo Laoch arrives in good order and can also feature, whilst veteran campaigner Mtada Supreme is also worth a second look from his reduced mark.